Following on from what many thought was a disappointing fifth record in “Giving The Game Away” Thunder shocked the fans by announcing their intention to split up. And they did. Luke recorded a solo record (El Gringo Retro) and eventually teamed up with Danny for the “Moving Swiftly Along” Bowes & Morley record in 2002. By late 2002, the rumours were swirling that something might be happening in Thunder Towers. Alice Cooper revived the Monsters of Rock brand and took it out on a UK tour; he would headline and support came from The Quireboys, Dogs D’Amour, a couple of DJs… and a newly reformed Thunder. Not just that, but Thunder had been back in the studio to record the “Back For The Crack” EP, and were working on a new album. The tour itself? Thunder routinely blew everyone off the stage, despite their years away. The album that the band were working on was eventually released early the next year, in 2003. 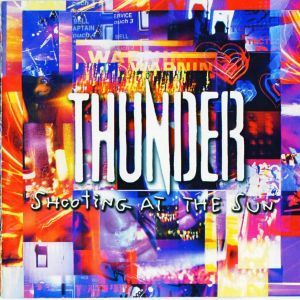 Anyone expecting a nice, gentle re-introduction to the world of Thunder would have wondered what hit them with the lead off track, and first single Loser. Luke unleashed one of the heaviest riffs he’d ever played, and Danny’s growled first line “Now I know you don’t love me baby” felt like it was perhaps aimed at the music industry. Nevertheless, this song absolutely fit in with the “new” Thunder ethos. It set the tone for the record, and indeed, the comeback. With Everybody’s Laughing there was somewhat of a return to Behind Closed Doors territory; this song always struck me as a distant relation to Too Scared To Live. This song featured lyrics relating the arrival of a mysterious Charlie to a party, that started a massive queue for the bathroom… hmmm, wonder what they mean? Luke’s guitar work on this was impeccable, and the band on the whole was truly into their stride on this. Right on cue, here comes a Thunder ballad! If I Can’t Feel Love was carved from the fine Thunder tradition of strong songwriting, catchy melodies and above all, near perfect vocal delivery from the incredible Danny Bowes. While not particularly memorable, it sits perfectly in the Thunder canon of slower love songs. Then we have the title track. Driven by a dirty, funky bass and drum line from Chris Childs & Harry James, this was something of a departure from the norm. Unlike anything on Giving The Game Away, this worked. Strong guitar and keyboard riffs over the top, slightly distorted vocals from Danny in places, and a killer chorus set this one apart from the usual album fodder. Setting a little precedent for the future here, The Pimp And The Whore unleashed the band’s feelings on fame, and manufactured music acts. Led by a strong piano line, Danny’s sneered take on the likes of Simon Cowell left you in no doubt where they stood on it. One of the angriest songs Thunder ever recorded, and one of the best. Slowing down again with one of the unsung gems on the record. A Lover, Not A Friend is another strong ballad about love gone wrong. As much as Thunder put on a hell of a live show and have great riffs, their power ballads with huge guitars, singalong choruses are a staple too – and this is one of their best. I thought this would have made a great single to be honest. No ground being broken with Shake The Tree – it’s just a nicely written rock song, lifted by the quality of performance from the band – Danny’s vocals especially. This could have been an out take from the Thrill Of It All sessions, it reminds me of that era. Not especially memorable, but nowhere near horrible either. Kicking back into high gear with Somebody Get Me A Spin Doctor – not the band from the 90s that sang about two princes, but those mysterious PR guys. Another song that Danny’s vocals lift to another level, I remember this being an absolute killer track live. Lyrically decimating the celebrity culture and those celebs that feel entitled to do what they like, this is one of the record’s highlights. The Man Inside is perhaps the weakest track on the record. It really reminds me of Giving The Game Away era music, which isn’t good for me. There’s a very Beatles/George Harrison vibe to this, something the band tried before, and I still don’t feel it works here. Out Of My Head is a track I didn’t initially like, but it has grown on me over the years. The backing vocals lift it a tad, but it’s dominated by a rolling, bluesy riff that starts heavy and just gains momentum through the track. File this one under competent, if nothing else. Closing the set off is Blown Away, and back to ballad land, complete with slide guitar licks. Probably the weakest of the slower tracks on the record, it threatens to sometimes develop into something incredible, but just never quite makes it. Again, perfectly acceptable, but not entirely memorable. So how did the comeback fare? of the 11 tracks, 7 or 8 quite comfortably fit into standard “old” Thunder territory, but there were glimpses of a band taking steps into a new direction – a good one at that. The important thing was the record sold well, was received well, and the tour absolutely killed. Thunder were back, and here to stay for a while. Recommended listening.